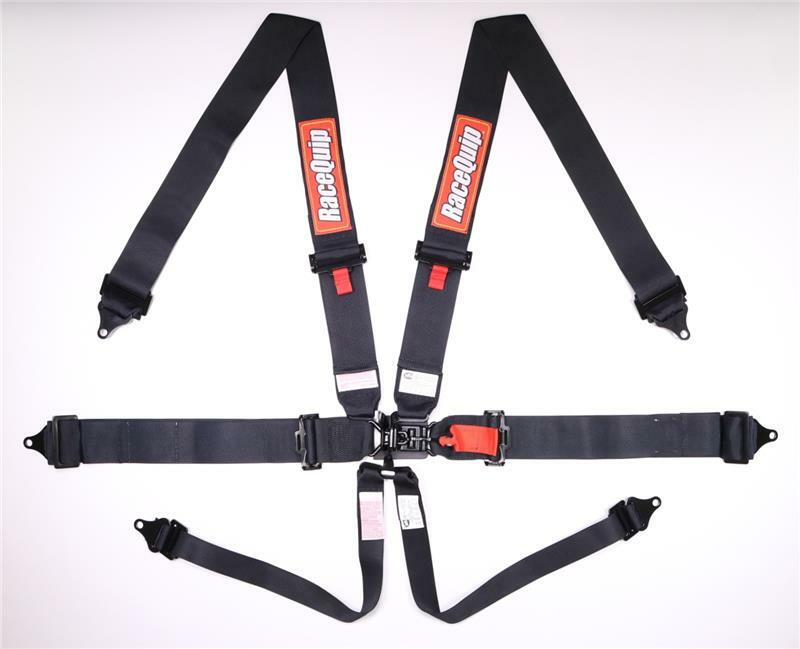 ‘RaceQuip’s small buckle Latch & Link Pro 6-point auto racing harness set has twin individual style shoulder belts and is manufactured using premium 3” polyester webbing and drop forged steel black hardware to exceed the SFI 16.1 rating. Shoulders adjust from 20” to 62” and the lap belt adjusts from 20” to 60”. This harness set is a “pull down lap” design, which means that the lap belt straps must be pulled down and away from the center latch & link buckle mechanism to tighten the belts . This Pro Harness set features a small compact design buckle that is lightweight and stays out of the way. Both shoulder belts and the sub-belt are hooked over the link; the link is inserted into the latch on the lap belt; the lever is then brought down into and over the link, securely holding all of the pieces in place. Since RaceQuip seat belt sets are “double adjustable”, lengths are simply adjusted on either end for ease of installation. Using the included three bar slide you can mount the belts by either wrapping them around a rollbar or by bolting them in place with the supplied ends (bolts not included). The buckle and all the hardware is black oxide coated for good looks and durability. Snap hook ends and eyebolts are sold separately if the user wishes to install belts in that manner. NOTE: RaceQuip harness sets and seat belts are NOT D.O.T. / FMVSS 209/302 certified for on highway use. They are only to be used in racing vehicles off of public streets and highways. All racing harness sets are designed to be mounted in a racecar to a rollcage or harness bar – if you do not have either, you should not try to install any RaceQuip harness set or seat belts. All SFI 16.1 rated RaceQuip harness sets can be re-webbed and re-certified upon expiration. Available in black or red, one “set” of seat belts equals one seat.